Which breed do anda think Snowball is? Do anda think Esmeralda was manipulative towards Quasimodo? What do anda think happend to Madellaine's parents? The Hunchback of Notre Dame has some of the most inspiring Petikan ever. Here are some that had the most impact on me, whether spoken atau sung. Clopin: Now here is a riddle to guess if anda can, sing the bells of Notre Dame, Who is the monster and who is the man? Laverne: Quasi, take it from an old spectator. Life's not a spectating sport. If watching is all anda do your gonna watch your life go sejak without you. a comment was made to the poll: Did anda like that Esmerelda ended up with Phoebus atau do anda think she should have ended up with Quasimodo? 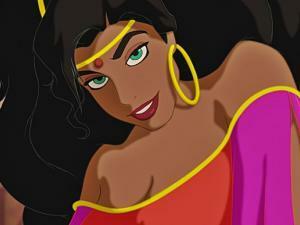 a comment was made to the poll: Which piece of Esmeralda fanart do anda prefer? a comment was made to the poll: Which is your kegemaran song?